When it comes to building the partnerships that allow you to co-create, co-develop, and monetize complex solutions, being ready to move forward with haste takes a robust framework that lets you identify and engage with the right partners at the right time. A customer-in, design thinking approach is needed. That means working back from the desired customer and partner experience. The experience could be delightful—the trip of a lifetime, made possible by a seamless network of partners, perhaps. Or it could be an answer to a problem that is potentially worth billions in value for the customer—the ability to produce high capacity batteries without the environmental and safety issues. The desired customer experience contributes to defining company strategy, which in turn informs the partnering strategy. Traditional thinking about identifying and selecting partners says to identify potential partners through a scouting and landscaping process that is both prescriptive and opportunistic. Once identified, conduct a business and technological due diligence; identify business, legal, and human risk; and assess strategic, operational, and cultural fit—hopefully to result in the ability to do a deal. Will this potential relationship create value for the end customer, the partner, our company—and other engaged ecosystem partners? If the assumption is yes, there is enough value for all, then be certain that you and your core partner(s) are aligned on the common purpose or goal you are working toward together—and that each is willing to assume the risks inherent in creating the specific value each seeks. What’s enough value? 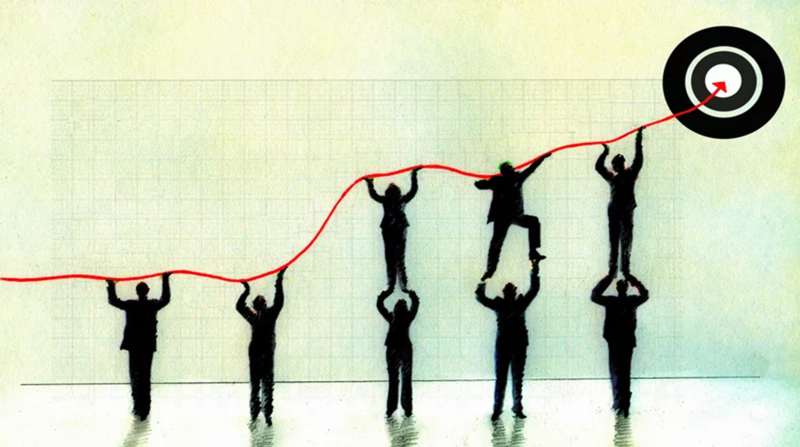 Every company has a benchmark rate of return it seeks on investments. You should be fairly confident that, if successful, the partnership will clear that hurdle. If the potential partners trust that their common purpose is likely to produce the value each seeks, then it is time to get to work to figure out your MVP, the Minimum Viable Partnership, using your partnering framework to shape how the partners will engage with each other, additional partners, and the end customer. 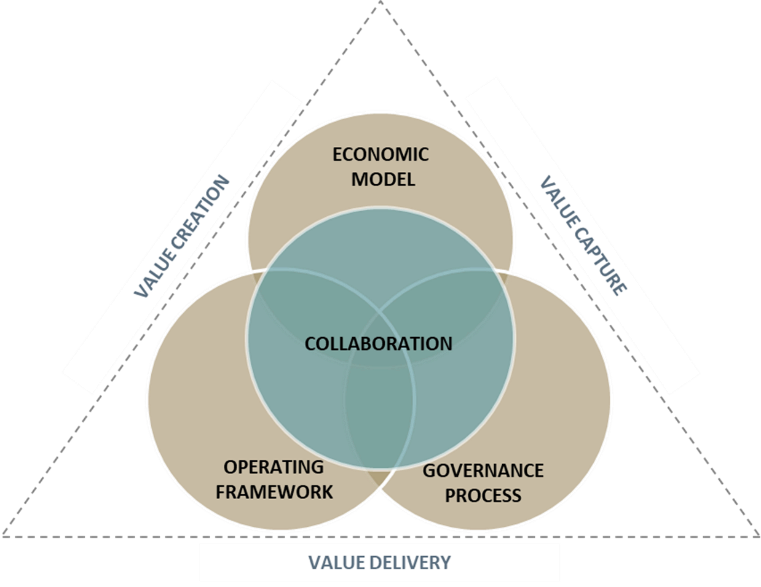 Once the value assumption is established, design the initial alliance business model (See Figure 1)—how value is created, delivered, and captured through the economic model, operating framework, and governance process. 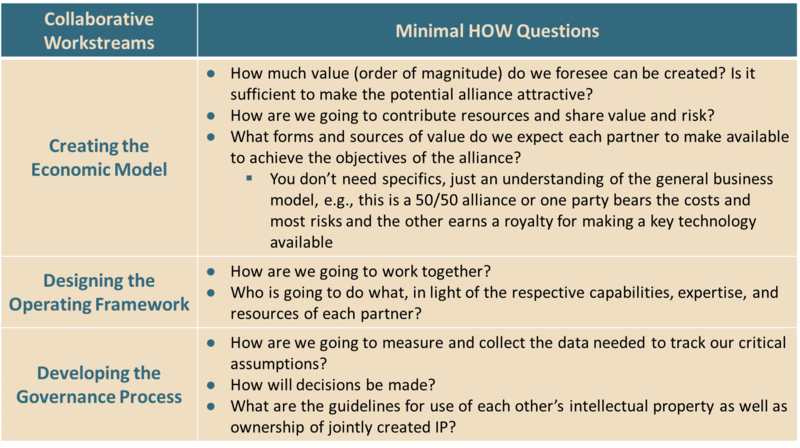 These components describe what each partner does and how the partners collaborate in pursuit of the common purpose that hopefully delivers on the value assumption. The core collaborations for solution development that address specific customer needs are strategic, multi-faceted, have a high level of complexity, and will be unique and individually negotiated. To save time if you are entering into a number of similar complex collaborations, you may want to develop a standard model that can be a starting point for multiple partnerships of a certain type. At the start of a new partnership you have no choice but to make a number of assumptions in each of these three areas. The trick is to put just enough detail into each component so that the parties are willing to move forward with value-creating activities. After all, why spend weeks or months building a comprehensive business model for your new partnership only to discover a fundamental flaw in one or more of your key assumptions? With this minimal framework in place, you can quickly get to the design of the first iteration of your solution and be ready to engage with customers and other partners needed to iteratively develop it and take it to market. To partner successfully at this fast pace, a simple document, such as a Memorandum of Understanding (MOU) or a Teaming Agreement can suffice to carry you through the MVP period—the testing of your most critical assumptions about value. Cisco’s Hyper-Innovation Living Labs (CHILL) uses a very similar approach, defining “focus zones” about a certain customer need, problem, or opportunity; assembling ecosystem partners to create a prototype solution, and testing it with customers. It uses a simple scorecard and a two-page agreement to kick-off the work. Are we skipping the critical step of vetting potential partners, conducting due diligence on their capabilities and technology? No, we are not. With a value assumption strong enough to start working together, your due diligence is conducted in real time, in the real world, and mutually. You’ll learn enough about each other to identify the risks that must be managed and the challenges to realizing the full intended value of the alliance. Armed with this understanding, you and your partner(s) will have market validation and be on your way to a productive collaboration faster than if you took the time to identify and traditionally evaluate partners, build a business plan, and create a comprehensive contract. Our next post will discuss how to learn fast whether your assumptions are right or wrong, iterate them as required without breaking your partnership, and be well on your way to capturing intended value.